Pre-enlistment studio portrait of 5092 Private (Pte) Albert Charles Pike, 18th Battalion, of Leichhardt, NSW. 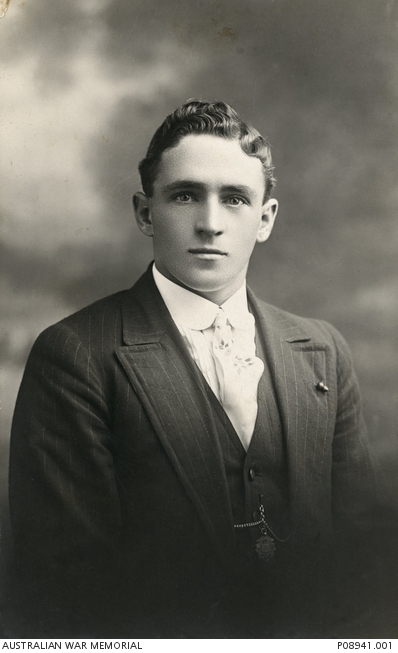 An linesman prior to enlisting in January 1916, Pte Pike embarked from Sydney with the 13th Reinforcements on board HMAT Kyarra (A55) on 5 June 1916. Pte Pike, a signaller, was killed in action at Lillebecke, Passchendaele, Belgium, on 9 October 1917 when the pill-box in which he and two other men were setting up equipment was hit by a shell. Pte Pike was 24 years of age.